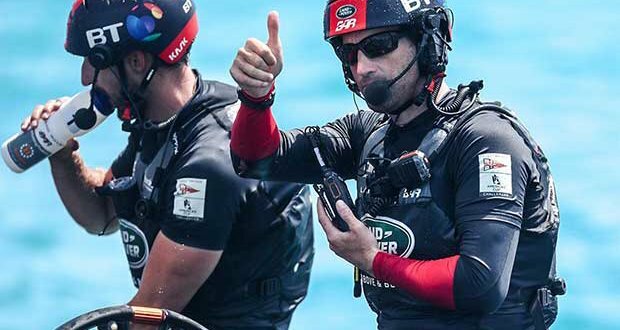 Sir Ben Ainslie and Land Rover BAR arrested the run of losses the British team suffered in the first Round Robin stage of the Louis Vuitton America’s Cup Qualifiers, kicking off round two with a second win of the competition, again beating Artemis Racing who had a tough day in Bermuda. There was to be no redemption for the Swedish team from their Round Robin 1 loss to Emirates Team New Zealand at the start of the Louis Vuitton America’s Cup Qualifiers Round Robin 2 stage, falling to a second defeat in as many days to the Kiwis. Yesterday, in what was the most thrilling and contentious day of racing in the 35th America’s Cup so far, the Swedish team were denied a victory over their Kiwi rivals following a dramatic late penalty in the final race of the day in Round Robin 1. That penalty was the subject of much discussion overnight after Richard Slater, ACRM’s Chief Umpire said that, on reflection, the umpires would have made a different decision. However, the race result stood so it was back to the action on the Great Sound for the start of the Round Robin 2. Picking up where the competition left off, day four started with a mouth-watering rematch between the two nations as the Swedish team looked for revenge for their loss in Round Robin 1. The Swedes looked odds on to achieve just that in the early stages of the race as they led from the start, building up a 20-second lead following a big nosedive from Emirates Team New Zealand in the lead up to gate 2. However, the Kiwis, helmed by Peter Burling, recovered spectacularly from the setback, chasing down the Swedes and cutting their lead to just three seconds at gate 3 before wiping out the lead altogether at gate 5. In what appeared to be déjà vu from yesterday’s match, the two boats closed in quickly to the bottom mark on opposite tacks. Artemis Racing as the give-way boat on port did not keep clear of the Kiwis and earned a penalty, since Burling had to slightly duck to avoid potential contact. The Artemis Racing late match penalty allowed Emirates Team New Zealand to coast to the finish line, winning by one minute and 31 seconds over the Swedish team. The triumph saw Emirates Team New Zealand secure their fifth victory out of six races in the qualifying stages, equalling Oracle Team USA’s points tally in the standings ahead of the American team’s race against Groupama Team France in race two, albeit briefly. “We had a little scare when our rudders came out of the water but we made sure we didn’t crash down,” said Emirates Team New Zealand helmsman Peter Burling on his team’s early nosedive. “From there we fought back really hard in what was a massive effort and we are all really happy to have got another win. Meanwhile, Artemis Racing helmsman Nathan Outteridge was left to rue poor decisions in their defeat to New Zealand, on a day which also saw them suffer a second successive defeat to Land Rover BAR. “We have had some pretty disappointing races so far in the America’s Cup,” said Outteridge on his team’s lack of current form, having claimed just two victories to date. “It was a pretty tight race against New Zealand until we misjudged the top mark and ran out of steam allowing them to pass us and win. Ultimately, the Kiwis were not level at the top of the standings for long as Jimmy Spithill’s Oracle Team USA restored their point advantage with a comfortable and impressive victory over Franck Cammas’ team. Having successfully hooked the French boat in the pre-start and crossing the start line seven seconds in front, Oracle Team USA set about building their lead in the early stages of the race. Groupama Team France’s task was made even harder following a penalty for crossing the boundary mark on leg two, forcing them even further behind the American team who raced well clear. However, the Americans did not have it all their own way. Late in the race Tactician Tom Slingsby reported over the team radio that, “We have an issue,” leading to Kyle Langford having to make running repairs to their boat’s wingsail on leg five. However, despite the issue, Oracle Team USA continued to sail smoothly, meaning there was to be no late drama or shock and the Defenders of the ‘Auld Mug’ finished the race one minute and 56 seconds ahead of their opponents. “We had a good race and a good day,” said Oracle Team USA helmsman Jimmy Spithill. “We had a slight fracture to the wing but there was a great reaction from the guys and everything was resolved. We had a nice lead so we just took our foot off of the accelerator and eased home. “The shore team are looking at things now and I’m sure there will be no issues. For French helmsman Franck Cammas, he believes Groupama Team France need to race more smartly after being punished by a slight mistake in their pre-start against Oracle Team USA. “For me it is not about being more aggressive in the pre-start it’s about being more smart,” said Cammas, whose team remains bottom of the standings on two points despite their improved form. “We made a mistake in the pre-start and that put us behind early on. Our positioning was bad and that was a big mistake to make. Meanwhile, Land Rover BAR secured a much-needed victory in the final race of the afternoon (race three) as they overcame Artemis Racing with a 30 second advantage at the finish line. Having won just one race in the Louis Vuitton America’s Cup Qualifiers Robin 1, also over Artemis Racing, the pressure was on Sir Ben and his team heading into the encounter. However, that pressure was not evident out on the water as the British team made a better start than their Swedish rivals, who were racing for the second time on the day. In a much improved performance over the previous two days, Land Rover BAR, who hit the highest speed of the competition so far at just over 43 knots, maintained a comfortable advantage throughout the race as they kept the Swedes at bay. Despite a slight touch down by the British team at mark four, they recovered quickly to ease over the finish line 30 seconds ahead of Nathan Outteridge’s team to seal a much-needed victory. That win moves Land Rover BAR onto four points in the standings, and more importantly, two points clear of bottom-placed Groupama team France. “We had some pretty frank discussions about our sailing last night and how we needed to rectify that,” said Ainslie, whose team clinched only a second victory in the Louis Vuitton America’s Cup Qualifiers. “We’ve been disappointed in our performances so far but our boat speed was significantly better and I’m really proud of the team for the way they set up the boat. “We’ve had a few tough days so to go and beat Artemis Racing, who are a tough team, is a really big win for us.